! Warning - excessive bullet points and wandering philosophy ahead ! The above image source was of famous hand prints in caves. 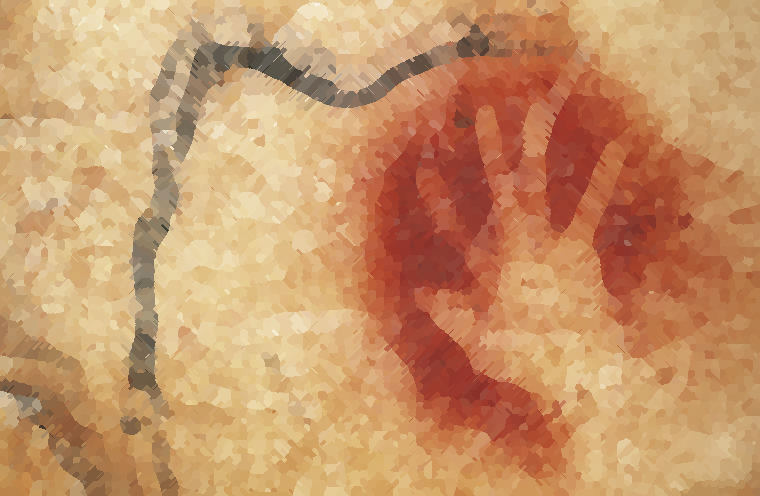 Early cave dwellers doing early art blew early pigments around their hand, onto the cave wall. I like to think that they knew their hand was something special - look at that glorious opposable thumb! It was the physical manifestation of their awareness and problem solving. Don’t like that bug? Hand smash! Hungry? Hand put bugs in mouth until hunger = False. It was the primary problem solving tool, augmenting the mind, limited by physical realities of a hand (ie scale). We are comfortable measuring by an abundance or an absence. Problems are typically defined as extremes of either. Augments mind, transcends hand-tool, has limitations. We technologists of 2018 CE live in this current-generation manifestation of our awareness and problem solving. We continually refine this ever-less crude tool. We model our world and our problems with software, crudely, via creation of software tools. We might be seeing some early slivers of this. I think it might have parallels to the ending of the movie Arrival. The radical rate of technology change I’ve seen excites me, and is a core reason I choose software for my life’s work. I feel lucky to participate in the “NextThing”.